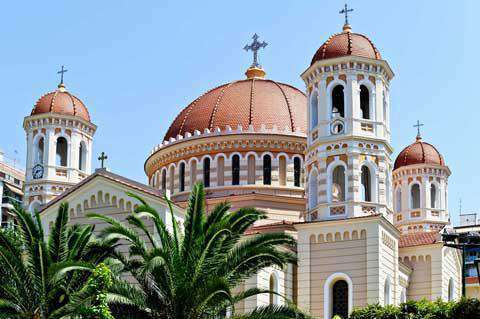 How much does it cost to travel to Thessaloniki? How much money will you need in Thessaloniki? €107 ($121) is the average daily price for traveling in Thessaloniki. The average price of food for one day is €33 ($38). The average price of a hotel for a couple is €127 ($143). Additional pricing is in the table below. These average travel prices have been collected from other travelers to help you plan your own travel budget. Thessaloniki is the second largest city in Greece and serves as the capital city of the Central Macedonia region. It also has a rich history dating back more than 3,000 years. As a visitor, you'll find that the city has been touched by the Roman, Byzantine, and Ottoman empires, all of which left their mark. In particular, the many Byzantine churches are quite impressive, with some of them listed on the UNESCO World Heritage list. Thessaloniki is a haven for culture in Greece. There are many popular festivals throughout the year, and it's considered a party city with a young vibe. Regardless of what your travel preferences are, this city really has it all, including excellent food, plenty of history and culture, as well as an active nightlife. The city's climate is humid subtropical. The winters are generally dry with a significant amount of fog. Temperatures may drop down to -10 degrees Celsius, and there is often wind. The summers can be hot and humid. Temperatures generally reach about 30 degrees Celsius and rain is rare. When it does rain, it is most often in the form of thunderstorms. There are a good number of historic sights worth visiting throughout the city. Head to the northern side of the city where the Byzantine walls are still standing. You should also visit the White Tower, which dates back to the 16th century and is an important landmark for the city. There's also a great seafront promenade that is enjoyable to walk down. The entire promenade covers a length of 12 kilometers in its entirety. Make sure you head to the upper town where you can see traditional old houses, quaint cobbled streets, a Byzantine citadel, and the Eptapyrgion fort. There is also no shortage of museums and galleries throughout the city, many of which are quite impressive and informative. Thessaloniki is divided into a variety of different neighborhoods, each with its own character and atmosphere. Some of the more interesting neighborhoods include the beach promenade, which is a popular place to hang out. It's lined with cafes and bars and is a great place to enjoy a walk. It's also a popular area for nightlife. Aristotle Square is at the center of the city, close to the waterfront. It's the most famous square in the city and is surrounded by interesting architecture and restaurants. Old Town Ano Poli is to the north of the modern town. This area used to be the Turkish and Jewish Quarter. Today it's an interesting place to walk around. On the western side of the port is Ladadika. It's a popular area for nightlife and it has a variety of cafes and restaurants. Egnatia has many historic sites including the Roman Agora and the Palace of Galerius. Navarino Square is also at the center of town and is a popular place to hang out in the evening. Many people head to Thessaloniki for its atmosphere. There are many cafes, clubs, and bars around town so it's worth relaxing and soaking up the city's character. The city has a good nightlife as well, so there are not shortage of activities late into the evening. Concerts are popular throughout the year. Also make sure you take a walk down the promenade. This is a great area to people watch and get a feel for the city. Thessaloniki cuisine makes use of a lot of spices. The food is excellent and there are a lot of local specialties that you should try. Sweets are particularly popular and favorites include Tsoureki, a plaited sweetened bread, Baklava, Bougatsa and Galaktoboureko. If you're interested in purchasing some local food specialties, head to Modiano market. Here you'll find sweetened breads, baklava, pastries and desserts. They are all quite delicious and many are freshly made. Meat dishes include gyros and souvlaki. There are many affordable places around the city that serve these favorites for a cheap price. Other options are soutzoukakia, which is a minced meat that is grilled and served with pepper flakes, and Patsas, which is a tripe soup. In general tavernas and restaurants are reasonably priced with good quality food. It is worth eating out while you're in town because the atmosphere, cuisine, and experience is worth the cost. You'll likely find yourself using the public bus system to make your way around the city most of the time. You can purchase your tickets ahead of time at a kiosk, or, if you have exact change, you can buy them from the driver. You really have three ticket options. The one way ticket costs 80 cents and is good for one trip. You can get a two journey ticket for 90 cents. This is good for two trips in a ninety minute period. There's also the option of a day pass for four euros. This will give you unlimited trips during that time period.